Happy December, fellow foodies! Every month, I choose a Dallas restaurant that serves a brunch that is sure to please to host Dallas Blogger Brunch. This month we dined in secret style (in a room behind a sliding bookcase!!) at The Theodore. All of your carb-loving dreams will come true when you try their bread basket- just look at that chocolate croissant! Wash it down with a traditional or grapefruit mimosa and you're on your way to "brunch heaven." The Theodore specializes in "American Classics with a Twist" and they don't disappoint. As is tradition, I tried the french toast and ordered the Sticky Toffee French Toast. It was HUGE! One extra large piece of Texas-sized toast, filled with cream cheese, and topped with pecans, brown sugar, and a carmelized banana. It was delicious. About half of the girls ordered the Sticky Toffee French Toast and we were on carb cloud 9 after brunch. Because this was our "Christmas brunch," I was thrilled when Dale from Savvy Sleepers asked if she could give everyone one of her Savvy Sleepers satin pillowcases! I wrapped each box and used an ornament as the gift tag and place card! The ornaments were done by Amanda from Renewed Calligraphy and were so perfect! All of the girls were so excited to receive such a lovely gift- I can't wait to use mine! Fellow blogger, Chiara Marie, was sitting next to me so I was able to snag a bite of her Fried Chicken and Coconut Waffle! Yum! "The others" (the more health-conscious!) feasted on Sweet Potato & Kale Quiche, Smoke Brisket and Egg Tacos (featuring brisket from Smoke Restaurant), and the Egg & Ham Croissant, to name a few menu items. 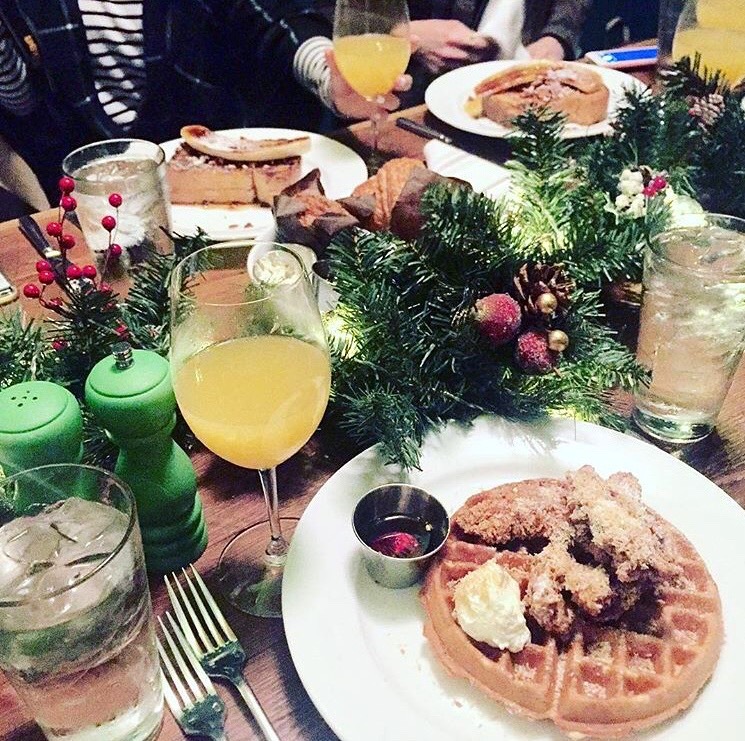 What a great way to end this year's lineup of brunches. I'll be back to The Theodore soon for more of that french toast! 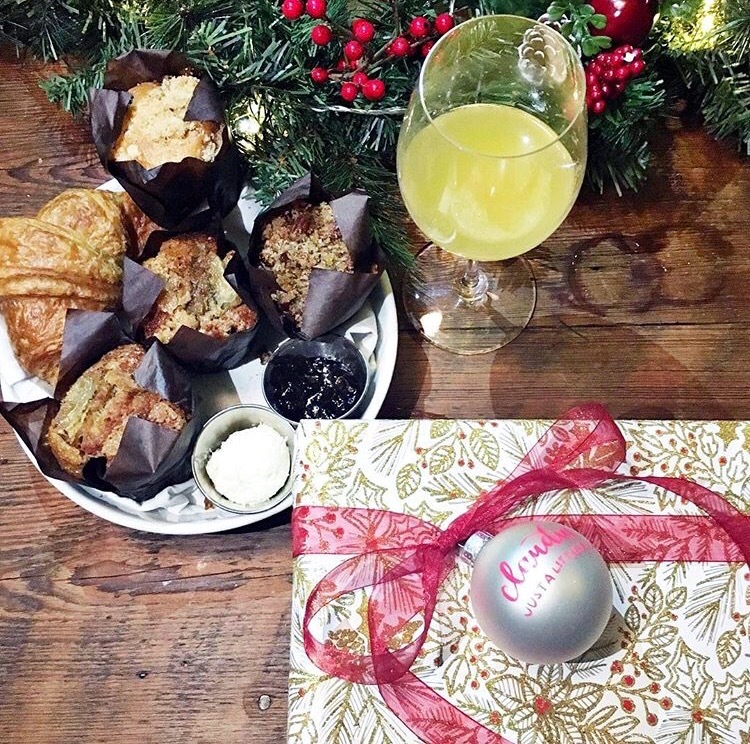 Thank you to The Theodore for hosting our Dallas Blogger Brunch- Christmas Edition! Thank you to Savvy Sleepers and Renewed Calligraphy for making our Christmas gifts so special!